Following their decision to acquire xoJane and Hello Giggles, Time Inc. has launched a website called Motto (tagline: “Words to live by”) “dedicated to empowering the next generation” of women. 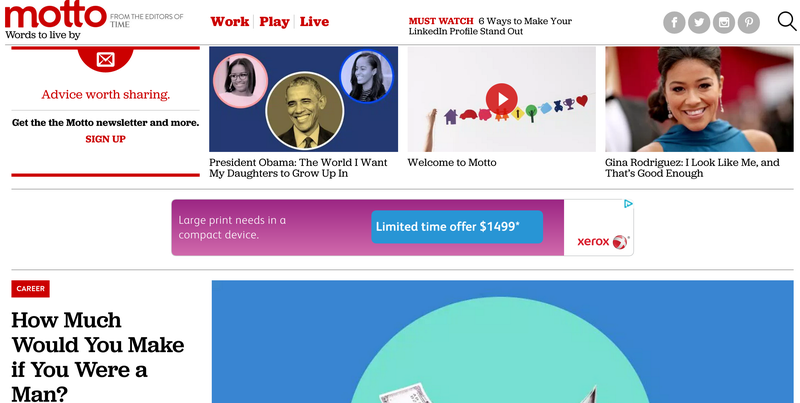 “Over the last two years, TIME’s digital audience has expanded dramatically, and close to half our readers are millennials,” Time’s managing editor Nancy Gibbs and Motto’s editorial director/Time’s editorial director of audience strategy Callie Schweitzer write in an introductory post about the decision to launch what’s essentially a new vertical for the website. They go on to explain that Motto will work with the “influencers, inspiring leaders and cultural icons” Time has relationships with—including at one who has her own content platform for young women. Motto’s initial contributors include Barack Obama, Lena Dunham, Michael Kors, Shonda Rhimes, Megyn Kelly, Danny Meyer, Jenna Lyons, Marie Kondo, Tony Fadell, Ina Garten, John Green, Kirsten Gillibrand, Jorge Ramos, David Chang, Robert Lopez and Kristen Anderson-Lopez, Alan Stern and more. Obama’s article is entitled “President Obama: The World I Want My Daughters to Grow Up In” and Dunham’s—co-written with her partner Jenni Konner—is an open letter to Donald Trump, while Kors and Kondo were previously acknowledged by Time’s annual 100 list. Other contributors who already have pieces up include Ivanka Trump on how to negotiate and Tracy Anderson on how she became someone who works out in the morning. The site also has features like an interactive that allows you to explore how much money you’d make if you were a man, and how to pack easily. Video content seems to be a priority. “It’s intended to be inspirational and motivational,” Schweitzer told the Wall Street Journal of the sub-site, which is divided into three categories: work, play and live. To help keep the cost of this new venture down, the Journal adds that “Real Simple, Southern Living and Health will also provide articles.” Though Motto touts their millennial readership, they also note that it’s a continued strategic move on Time Inc.’s part to find new income sources. The debut is the company’s latest stab at ramping up its digital advertising reach at a time when print ad revenue is declining. Time Inc.’s print and other advertising revenue fell 12% to $319 million for third quarter ended Sept. 30. While digital advertising revenue increased 22% to $79 million, it wasn’t enough to offset the decline in print. Additionally, Motto boasts a newsletter you can subscribe to, because newsletters (not the paper kind) are very in right now for young ladies.